It's Saturday night and I hop into my car after seeing the movie, Love, Simon. It's no secret I'm a Becky Albertalli fangirl. I've read the book, Simon vs the Homo Sapiens Agenda five times, have cried over The Upside of Unrequited, pre-ordered Leah on the Offbeat, and I met Becky at YallFest in 2016. (Twice. She follows me on Twitter now and patiently and kindly puts up with all of my flailing.) The movie was all I had hoped it would be. Of course there were a couple of minor tweaks I would have made, but nothing that ruined my enjoyment and appreciation of it. I laughed and cried and one of the best moments was when the theater erupted in applause at the big romantic scene towards the end. Nothing could warm my heart more. Thank goodness for friends who don't judge too harshly when a grown woman gushes about her "precious baby Simon" and how she wants to "squish his cheeks and give him a hug." As I opened up "Simon's Playlist" on Spotify and drove home, I couldn't help but think about how glad I am this movie and book exists. There are so many kids (and adults) who will, and already, have gotten so much out of it. I think of the friends I've known who are somewhere on the LGTBQIA+ spectrum and how much media like this would have meant to them when we were in high school. Because while Simon is one of my favorite books and I loved the movie - this story isn't for me. It's for them. I'm so happy they have it. As I drove, my mind wandered to the books, movies, and TV shows that are for me. 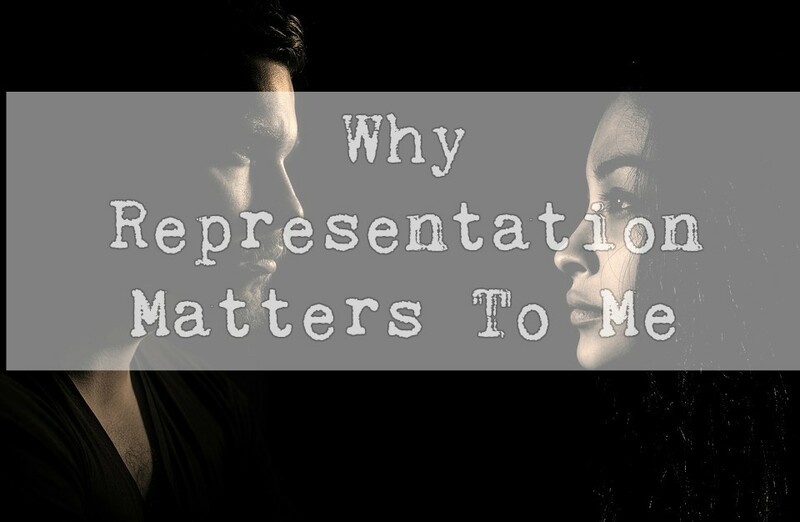 The ones that deal with the types of representation which would reflect who I am. I've talked about this topic before and more of my personal reasons for representation in media on my now abandoned YouTube channel. It was in response to a video My Name is Marines made, which was much better done than mine. I want to revisit this topic, but here on my blog. My video was fine, but not as good as I want it to be, and I tend to write out my thoughts better than speaking them sometimes. Go figure. For a long time, I purposely avoided anything which featured a character who had a disability because whenever I saw any, it was terrible. The character had no depth, all they ever talked or thought about was their disability (sorry, I don't wake up thinking about it every single morning), and they were always this weird-perfect-better than everyone else-someone we should all aspire to be- and only existed to be inspirational-being. I also never saw a character who had a condition I could fully connect with. They would be blind, or deaf, or permanently in a wheelchair, and I was none of those things. I have Osteogenesis Imperfecta which basically means I break my bones a lot and have short stature. (I'm 4'2.) For most of my childhood, I had braces and a walker. Then in jr. high I didn't need braces anymore, but we did get a wheelchair because that was an easier and safer way for me to travel long distances and to carry my books through the school hallways. Even then, I wasn't in it permanently. And none of the characters I saw had short stature the way I did. Then, when shows like Little People, Big World, came out, I was able to connect with them on a certain level. But we have completely different conditions, so it still didn't quite fit the bill. As I thought about it, I realized it went deeper than this though. Part of me felt I wasn't allowed to enjoy media featuring disabilities. My strongest memory stemming to this is from the 1996 summer Olympics. Naturally, all of us kids were excited about it and all summer talked about our favorite Olympians and moments. One day, I was with some of my friends and we were listing our favorite gymnasts. My answer was Kerri Strug. The other girls, who were very familiar with my disability and all of my injuries which sent me to the ER several times a year, rolled their eyes and said "you only like her because she got hurt." Embarrassed, I tried to defend myself by saying that I also thought she was a good gymnast. But it was no use. Already, my opinion was regarded as not valid. I wish someone had told me "So what if you only like her because, like you, she's experienced extreme pain but also had to keep going and push through it?" Because it's a completely valid reason to admire someone. Yes, I understand we were in fourth grade and kids can be ridiculous. But, we also can't deny that sometimes what appears to be the smallest things from childhood stick with us for a long time. Even in college my friends would tease me about my love of Snow White, and said it was only because the dwarfs were short like me. Later in my 4th grade year, I picked up a book called Midnight in the Dollhouse by Marjorie Filley Stover. It was a novel about a young girl living in post-Civil War time and broke her hip, then during the healing process was confined to her bed for three months. To pass the time, her family got her a set of small dolls and a dollhouse for her to play with. (Of course, the dolls came to life and had adventures.) This book ticked so many boxes for me. I was an avid reader of the American Girl books, so historical fiction was my jam. Then, I loved to play with my dolls and create elaborate stories for them. But on top of it, was a character I could connect to. A majority of my childhood was spent with broken bones, having to stay in bed for long periods of time, and needing to find something to do. I remember I was even excited because when the character healed, her left leg ended up being slightly shorter than her right leg. I had the same thing! While she didn't have the exact same situation as I did, for the first time I had a character I could see myself in. I didn't even realize how much I was craving for a story where I could say "me too!" until I read one. But, I never tried to seek any more out. Maybe I thought it was a fluke, and for the most part, it kind of has been. Because whenever I did see or read something with a character who had a disability, it wasn't done well. How awesome it would have been for me to read a book about a kid with braces on their legs. Or now as an adult to read a book about a character with a disability and it doesn't end with them dying, or moaning and groaning about their situation all of the time, or being so perfect and inspirational it's impossible to connect. Which, we are coming along in that area. But we still have so far to go. Then, I think about all of the other areas in my life I could see more in media. A big example was when I read The Upside of Unrequited by Becky Albertalli. The premise is about a teenage girl who has had 26 crushes, but never a boyfriend. As a perpetually single person, this book resonated with me on a deeper level than I had anticipated. She expressed feelings and insecurities I had back then, and even now as an adult, when it comes to relationships I never fully admitted to myself. So often we read stories about people who are in relationships and have had relationships as though it's assumed EVERYONE has had these experiences. I want more stories about the rest of us. Then, there's also the point of that we don't have to be like a character in order to learn from the story. When I go back to Simon vs the Homo Sapiens Agenda, I think of how much I learned and connected to the book. No, I'm not a gay teenage boy. I have no idea what that's like, I'll never have to come out to my family, or experience someone blackmailing me about my sexuality. But, there were still so many other elements of the book that I could relate to when I was in high school, and I was able to see something from a different point of view. That's the beauty of storytelling. We see through someone else's eyes. I've been watching a lot of Queer Eye on Netflix lately, and so much of it is about just this. People who are completely different from one another learning from each other. There's power in learning and seeing the perspective of someone different than you are. And there's power in seeing yourself in a story. Just think of all of the black kids right now who are watching Black Panther and feeling empowered by it. Think of all of the women who felt the same when they watched Wonder Woman.